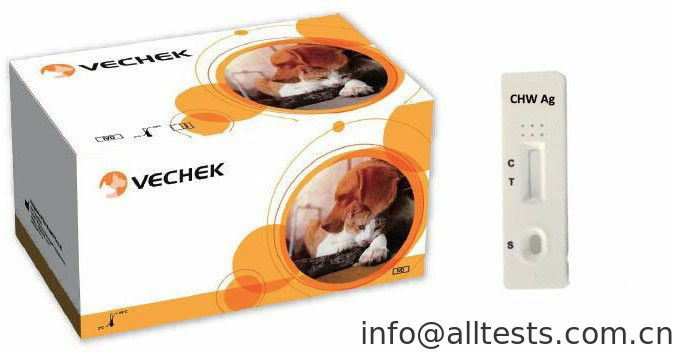 CHW Antigen Rapid Test Cassette is based on sandwich lateral flow immunochromatographic assay. The test cassette has a testing window. The testing window has an invisible T (test) zone and C (control) zone. When sample is applied into the sample well on the cassette, the liquid will laterally flow on the surface of the test strip. If there is enough canine heartworm antigen in the sample, a visible T line will appear. The C line should always appear after a sample is applied, indicating a valid result. By this means, the cassette can accurately indicate the presence of canine heartworm antigen in the sample. Collect feline’s fresh whole blood, and separate serum or plasma from blood as soon as possible to avoid hemolysis. Only use clear, non-hemolyzed specimens. Do not leave the specimens at room temperature for prolonged periods. Serum and plasma specimens may be stored at 2-8 °C for up to 3 days. For long term storage, Serum and plasma specimens should be kept below -20°C. 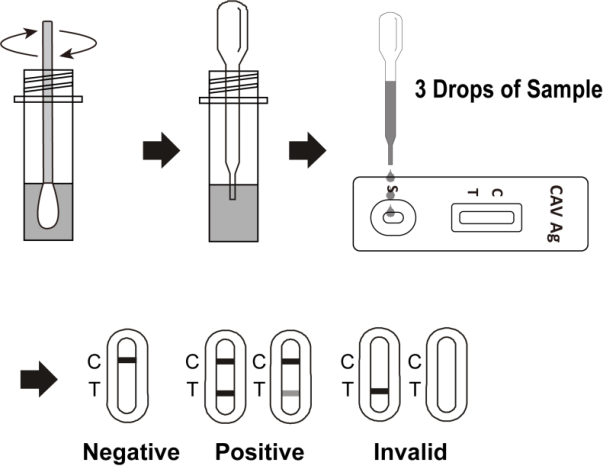 Hold the dropper vertically and transfer 1 drop of sample (approximately 10 μl) and immediately add 3 drops of buffer (approximately 80 μl) into the specimen hole(S), then start the timer. See illustration below.